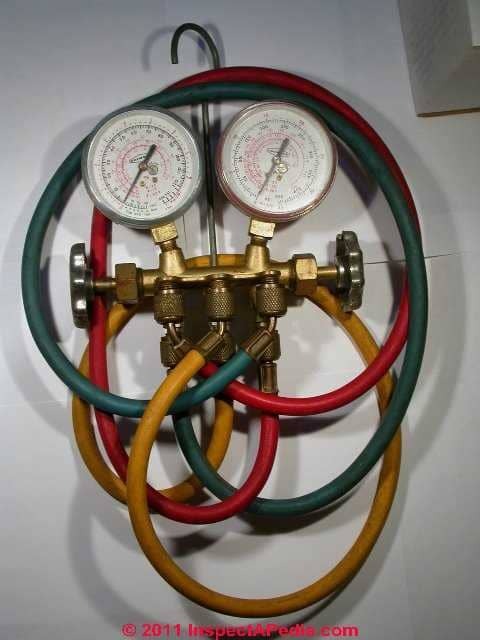 Air conditioner & heat pump refrigerant test gauges: this article describes the connections, use, and reading of a refrigerant gas pressure test gauge set. We describe the procedure for using test gauges when adding or replacing refrigerant: charging an air conditioner, heat pump, refrigerator with refrigerant gas. We explain how a refrigeration gauge set should be connected to HVAC equipment to avoid contamination damage and we review the refrigeration system evacuation and cleaning procedure. To keep moisture & dirt out of an air conditioner, heat pump, refrigerator, freezer, etc., in addition to finding and fixing leaks, we need to know how to properly use a refrigerant gauge set with charging lines, and how to use cap off plugs on the charging fittings. so that when the gauge hose fitting is connected to the service port on the HVAC equipment no outside air or moisture are pushed into the system piping. We use (and illustrate) a traditional Imperial System Analyzer gauge set that provides three charging lines (refrigerant canister, high side, low side). This is a diaphragm type gauge but other methods of measuring and charging systems are available. Temperature corresponding to pressure is shown in red on this gauge for R12 and R22, or for newer refrigerants on newer gauges. Vacuum is also shown on this gauge on a scale from 0-30 in. Hg. in green..
if you use pressure test gauges to measure the refrigerant pressure in the static or equalized air conditioning or heat pump system, the gauges only tell you the refrigerant pressure, not the quantity of refrigerant that is present in the system. For example at 70F ambient temperature and with R12 refrigerant, the static system pressure would be at 70 psi as long as there is enough refrigerant in the system to have at least some in liquid state. The compound gauge on the right of this gauge set is used on the high pressure side of the refrigeration system and shows refrigerant pressures, typically from 0 - 500 psi on the black scale or 0 - 35 KG/CM3On the outermost red scale. In the center of the refrigerant gauge the red scales give temperature readings for three older refrigerants (this is an old gauge): R502, R12, and R22. Central air conditioning systems, heat pumps, and split systems typically have service ports installed specifically for the attachment of test gauges for system inspection, evacuation, and charging. Residential refrigerators, freezers, and window or portable air conditioners typically will not have these service ports. To service one of those latter devices you'll need to cut the refrigerant line and install (solder in place) a tee and a service port. Our photo (left) shows four covered service ports on this split system compressor/condenser unit. That's because this unit supports two indoor wall-mounted cooling units. 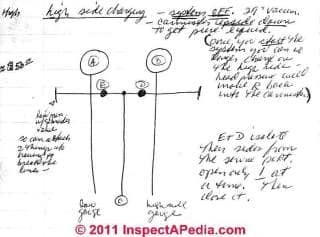 If its not obvious to you that the larger diameter line is the low pressure or suction side and the smaller diameter refrigerant line is the high pressure side, then really you should not be messing with this equipment before taking a refresher class in HVAC servicing and repair. Tapaline® and other piercing valves are available in various sizes to allow the HVAC technician to tap into the refrigerant lines on a system in order to perform diagnosis where there are not already service valves installed. Smaller bullet-type valves are installed using an allen wrench. Use these valves as a temporary service tool, preferably attached on the process tube. See COMPRESSOR / CONDENSER TYPES if you don't know what a process tube is. Watch out: do not leave these temporary test valves on the refrigerant piping - you're asking for a future leak. These valves are suitable to aid diagnosis of a refrigeration system by avoiding disturbing the troubled state of the system (as you'd do if you had to cut lines and solder in service valves just to do a test). After using a temporary tap-in valve on the process tube at a compressor unit, you should solder off the line puncture and add a permanent service valve fitting - the type that uses a schrader valve and cap - also referred to as an access valve or line valve. In the shop we connect both high and low pressure gauges to the equipment being tested. In the field technicians often use only the low pressure side of the HVAC test gauge set, since high side problems also show up on the low side. On test gauge sets such as ours shown here, the service lines always open or close a connection between the HVAC equipment refrigeration test ports and the gauges. The end-valves (silver handles) on either side of the gauge set then open or close a further connection between that valve and either high or low side connection and the yellow hose that will in turn connect to a refrigerant source. You'll notice in our photo that both ends of the refrigerant hoses are attached to the gauge set. On the front of this gauge (and more easily seen in the photograph) are three blind connector plugs to which we connect the hoses when the gauge is not in use - this step is to help keep the gauge hoses clean of debris. In the photo at left, the "live" hose connection ports are somewhat hidden behind the gang of hoses and the "blind" connectors used to keep the hoses and their end connectors clean when not in use. The gauge set has stop valve handles that you see on either side of the gauge. These controls open or close the high or low side service lines once they have been properly connected to the high or low side service port. As we've mentioned before, we would not normally connect our gauge set to the service ports without first attaching a can of the proper refrigerant to the gauge set service port and then using that refrigerant to purge any air that may be in the refrigerant hoses. That's to avoid blowing air and contaminants into the HVAC system. A blue flexible hose on the low-side gauge. In the photo above the blue hose is connected to the left-hand low pressure gauge port, while its free end is connected to a right-hand blind port. When in use the free end of the low pressure gauge is removed from its "blind port" and is then connected to the low side of the system at that service port. - the end that will connect to the HVAC equipment test gauge port - is connected to a left-hand blind port to keep the fitting clean when not in use. The high pressure gauge (red hose) will be connected to the high side of the system at that service port. A yellow hose on the center gauge service port just to help avoid any confusion in the field. The free end of the yellow hose is also connected to a center blind port to keep out debris. The center service port on the gauge set will connected to a refrigerant canister, charging device, or to an evacuator pump, depending on what the HVAC technician needs to do. Depending on which valves you open or close, this gauge set permits both checking pressure and/or charging the refrigerant system on either the high side or the low side. Watch out: Even all three hoses of your gauge set is connected to high side, refrigeration canister or charging cylinder, and low side, never open both high side and low side gauge connection valves at the same time. (C) is the service line at the gauge center, connected to a refrigerant gas source or perhaps to an evacuator pump. (E) is the functioning location of the low side control valve. Watch out: not all HVAC test gauge sets may have their high pressure and low pressure gauges in the same left and right positions. What is critical is that the low pressure gauge is connected to the low pressure port (by convention using a blue hose) and the high pressure gauge is connected to the high pressure port (by convention using a red hose). Watch out: Valves (D) and (E) are used to isolate their sides from the service port. Open only one control valve at a time, then close it before opening the other. Turn the equipment service valve in slightly and run the system. The gauge(s) will indicate what the system is doing. Watch out: as we warn at many places in this article series, do not send liquid refrigerant into the low side of a refrigeration system. Liquid refrigerant will enter the bottom of the compressor motor and can damage the compressor, or even if the compressor tolerates and passes the refrigerant through its pumping system, the refrigerant can carry away the lubricating oil from the compressor, and/or cause an air trap in the system. Watch out: Never open both high side and low side valves on the gauge set at the same time. We use the same procedure for attaching the gauges to the high side of the system. For the gauge set shown above, turn the valves all the way out to attach the gauges, since service ports are stopped OFF. Turn the gauge control valve all the way in (closed) to stop off the line to the evaporator/condenser (depending on which valve you are using). Then tighten the connection of the test hose to the equipment service port. Back-seat (all the way out) the equipment service valve to close off the service port, then remove the gauge and cap both the service port and the test gauge hose ends. What is the Process Port on an HVAC Compressor Motor & How is it Used? Question: OK to use the process port or charging port on the compressor itself to charge the system? I am charging a Commercial kitchen fridge with the compressor and condenser located externally from the fridge itself. The charging port on the service valve is leaking, there is a charging port on the compressor itself, can I use this to charge the system? Yes, if you're charging with gas not liquid and you're on the suction side. But I worry that the leaky port is going to continue to leak - I'm not an expert but in my experiences the valve cap doesn't make a reliable long term seal. Thanks, I check somewhere else and it tells me that the port I was talking about is a process port. There is the suction and discharge line, but this particular one says it's a process port. What worries me is the uncertainty of this process port. if it is on the low or high side of the compressor. Doing a little research about process ports I read that it's an "alternative suction line" - and on smaller HVAC compressor motors both ports are open to the same compressor chamber - so either could be used for charging. In some HVAC texts the process port or tube is used to evacuate the system and would still be in common with the compressor suction side interior. 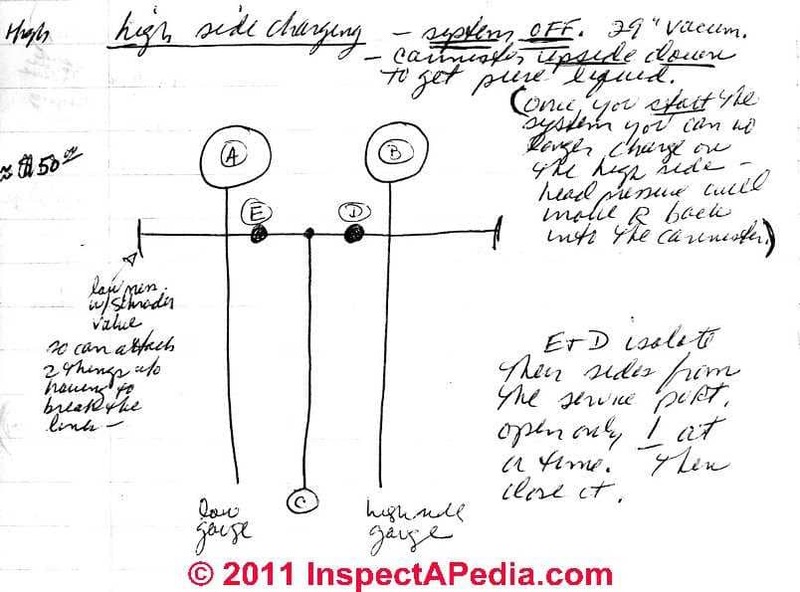 I have certainly read that HVAC techs charge (gas only ie low side) through a process port and even prefer that. On some higher-efficiency or larger compressors that's not so clear as I note below though I think the principal difference is the port diamater and its intended use. On some larger compressors the process tube may be a smaller-diameter tube used for an auxiliary function such as an ice maker - still charging through that port could be OK.
A definitive answer would come from the manufacturer of the specific HVAC compressor motor. Important! The AE2 is a high efficiency compressor and uses directed suction intake. It is necessary (with the exception of ice cube machine applications) to use the designated suction tube. For ice cube machines: Tecumseh recommends to use the process (alternate suction tube) as the suction tube. We recommend that the used refrigerant fluid is collected for later recycling or incineration, according to the following procedure: First, install a perforating valve in the compressor process tube. Connect the perforating valve to the recovery equipment that is then connected to the receiving cylinder. Now just connect the recovery equipment. Open the receiving cylinder valve and then the perforating valve. or at OVER CHARGED of REFRIGERANT, EFFECTS or select a topic from closely-related articles below, or see our complete INDEX to RELATED ARTICLES below. In our illustration of air conditioner service equipment pressure test gauges at page top and at left, you notice that there are two gauges and two sets of connectors and control valves. " Gauge pressure" can read either the pressure inside the condenser unit (the "high side" of the system) or the pressure inside the evaporator (cooling coil) or "low side" of the system. Note that gauge pressure is an absolute pressure reading before any correction for ambient temperatures around the unit. When comparing measured or gauge pressure with recommended refrigerant pressures it is necessary to correct gauge pressure for ambient temperature variations. 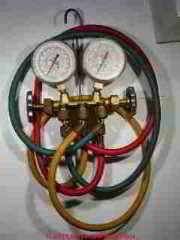 A/C equipment, gauges, refrigerant charging manuals etc. include pressure charts to aid in this correction. (38-45 degF example) - (18 degF temperature difference between inside the condenser and ambient) = 20 degF = the temperature at which the refrigerant must boil, i.e. the state change from liquid to vapor. Looking at 20 degF. in the table for R12 state changes shows us that we should see 21 pounds of pressure. At 80 to 100 psi pressure on the high side, if ambient temperature is 72 degF, heat will be transferred successfully to outdoor air at temperatures of 84 degF to 117 degF at the condenser coil. Continue reading at REFRIGERANT PRESSURE READINGS & CHARTS or select a topic from closely-related articles below, or see our complete INDEX to RELATED ARTICLES below. 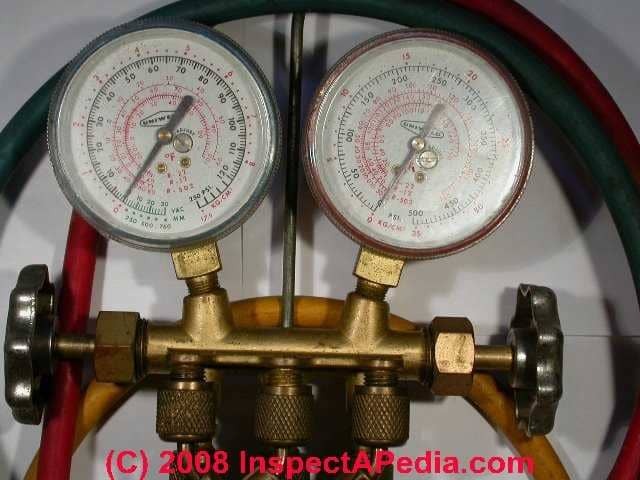 GAUGE, REFRIGERATION PRESSURE TEST at InspectApedia.com - online encyclopedia of building & environmental inspection, testing, diagnosis, repair, & problem prevention advice. Reece is Australia‘s leading supplier of bathroom and plumbing products with over 400 stores across the country including our market leading Bathroom Life™ showrooms. We also cater for more specialised industries through our Irrigation, hvac-r and Civil businesses as well Onsite which services commercial plumbers and volume home builders. Carbon fluoride; Freon 14; Perfluoromethane; Carbon tetrafluoride; Halocarbon 14; R 14; PFC 14 are synonyms for R14 refrigerant.